Main sources: Nowak, Ronald, 1991, Walker's Mammals of the world, Fifth Edition (two vols. ), Baltimore: Johns Hopkins University Press; Hoffmeister, D. F., 1986, Mammals of Arizona, Tucson: University of Arizona Press; Burt, W. & R. Grossenheider, eds., 1976, A Field Guide to the Mammals, Peterson Field Guides: Houghton Mifflin; Eisenberg, John, 1980, The Mammalian Radiations, Chicago: University of Chicago Press. 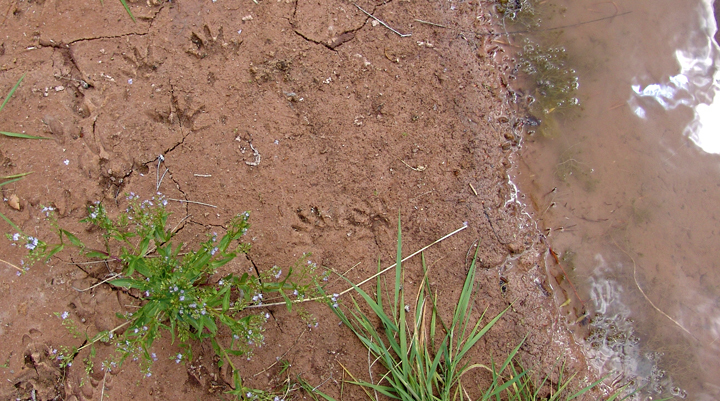 Above, our sole current image of a raccoon in the Middle San Pedro River area, photographed with an infrared camera on September 1, 2007. 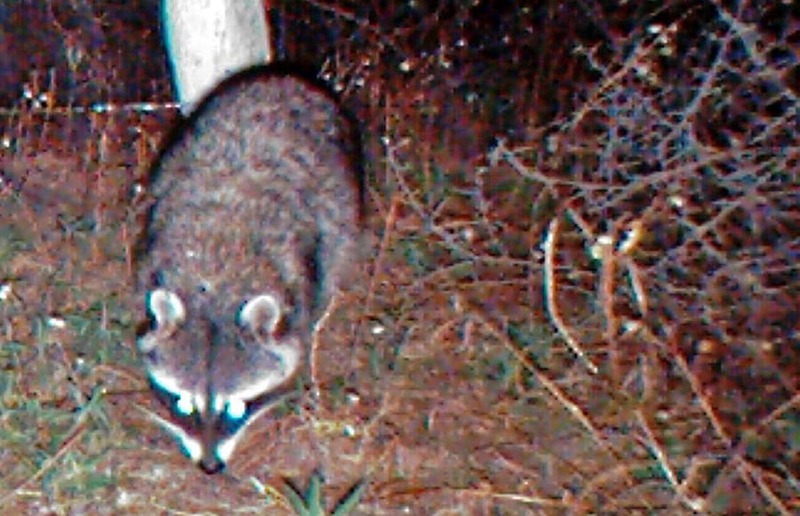 Raccoons are found mainly in bush or forest along waterways (and never very far from water), and their features are typical of Procyonids, especially the strong black mask over the eyes and alternating black-white rings on the tail. They are larger than our other Procyonid carnivores (see Coati and Ringtail), with head-body length from 16-24", tail length to 12", and weight up to 35 lbs. The hair on their bodies has a salt-and-pepper coloring. Mainly nocturnal, they are "opportunistic omnivores", whether dining on aquatic invertebrates, beetles, fish, berries, other fruits and nuts, small vertebrates, and various forms of carrion. They have well-developed senses of touch especially in nose and forepaws, and the hands are used very skillfully. They make dens in hollow trees, crevices, or among boulders, where females give birth in April to June to an average of four young who will leave their mothers in the fall or wintertime.